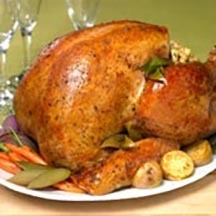 Fresh herbs impart their lively flavors to this extraordinarily delicious, yet simple whole roasted turkey. In a small bowl, mix olive oil, garlic, rosemary, basil, Italian seasoning, black pepper and salt. Set aside. Wash the turkey inside and out; pat dry. Remove any large fat deposits. Loosen skin from the breast by slowly working your finger tips between the breast and skin. Work it loose to the end of the drumstick, being careful not to tear the skin. Using your finger tips, spread a generous amount of the rosemary mixture under the breast skin and down the thigh and leg. Rub the remainder of the rosemary mixture over the outside of the breast. Use toothpicks to seal skin over any exposed breast meat. Place the turkey on a rack in a shallow (2 to 3-inch) roasting pan. Add about 1/4 inch of water to the bottom of the pan to prevent the drippings from burning. Allow the turkey to stand for 15 to 20 minutes before carving. Recipe and photograph provided courtesy of Foster Farms.